Vim is a text editor greatly loved by many programmers, because of its radically keyboard-centric design. When you're coding in Vim, you generally never touch the trackpad or mouse; everything is done with the keyboard. Indeed, your hands don't even move around very much on the keyboard, because Vim doesn't even use the arrow keys. To move the cursor left by one character, for example, hit the "h" key. The "l" key moves you one character right, "k" takes you up one line, "j" down one line. There are also tons of clever little key-commands that speed up text-editing: Type "dw" and it deletes the word you're currently on, type "d$" to delete to the end of the line. The upshot is that once you've mastered Vim, there's a glorious feeling of Csikszentmihalyian flow: Your fingers move in a blur of supremely economic, efficient movement. Your fingers spend far more time on the home-row keys. But wait, you might wonder: How does this work? What if you want to use h/l/k/j to type letters, not to navigate? Well, Vim has two modes -- "command" and "insert" mode. You enter command mode to use all those nifty shortcuts, and go back into insert mode when you want to type text. When you write in Vim, you're constantly shifting back and forth between those two modes, using the "esc" key to enter command mode. But hey! 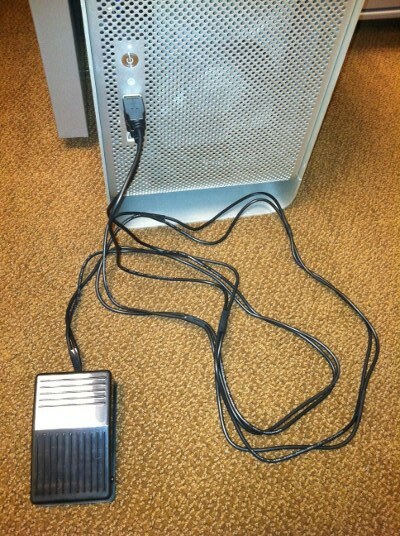 The programmer Aleksandr Levchuk hit upon a clever way to solve this problem: He created a USB footpedal. Put your foot down, and you enter command mode -- lift it up, and you're back in insert.